Visual Studio Code>Other>Mocha test runnerNew to Visual Studio Code? Get it now. 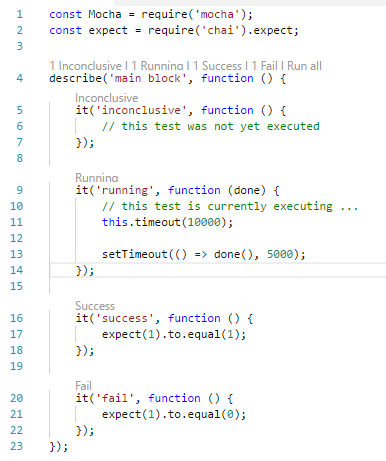 Code lens provider and runner for mocha unit tests. Creates code lens before each describe, it, suite and test function call in test files. Lense on it and test function shows last test result and can be used to run given test (using mocha --grep pattern - tests titles needs to be unique otherwise more than one test will be executed). Lense on describe and suite shows aggregated results from nested it and test and can be used to run all tests in given group / only test with specific status. To ensure Mocha test runner works property don't forget to set the mocha.nodeExec variable in your settings. You must provide an absolute path. This method is useful if you want to provide your own transpile command, and want to map the resulting build directory to your source directory. see example projects in .vscode-test directory. Mocha is searching for transpiled scripts **/*.test.js (configurable - mocha.glob) in project root directory or in mocha.sourceDir (appended to project root directory - used in tandem with mocha.outputDir for non es5 sources - see examples). If you want to automatically run a transpiler on your source, using the equivalent of the --require mocha parameter, set the mocha.requires variable in your project settings.